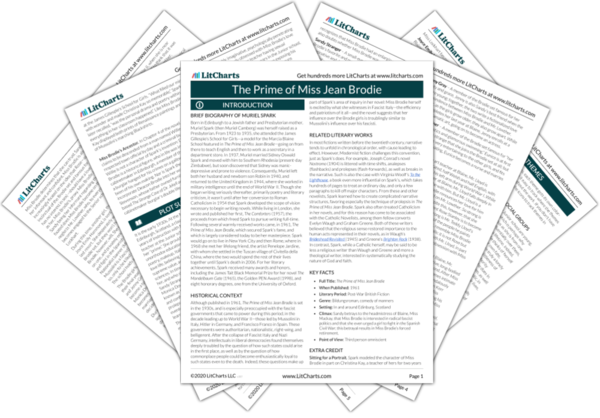 Instant downloads of all 946 LitChart PDFs (including The Prime of Miss Jean Brodie). 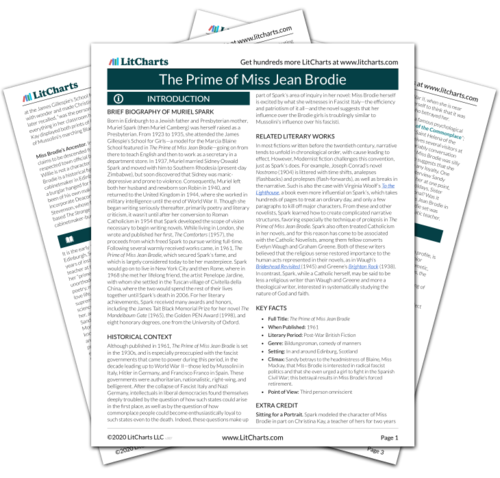 Welcome to the LitCharts study guide on Muriel Spark's The Prime of Miss Jean Brodie. Created by the original team behind SparkNotes, LitCharts are the world's best literature guides. A concise biography of Muriel Spark plus historical and literary context for The Prime of Miss Jean Brodie. A quick-reference summary: The Prime of Miss Jean Brodie on a single page. In-depth summary and analysis of every chapter of The Prime of Miss Jean Brodie. Visual theme-tracking, too. Explanations, analysis, and visualizations of The Prime of Miss Jean Brodie's themes. The Prime of Miss Jean Brodie's important quotes, sortable by theme, character, or chapter. Description, analysis, and timelines for The Prime of Miss Jean Brodie's characters. Explanations of The Prime of Miss Jean Brodie's symbols, and tracking of where they appear. An interactive data visualization of The Prime of Miss Jean Brodie's plot and themes. Born in Edinburgh to a Jewish father and Presbyterian mother, Muriel Spark (then Muriel Camberg) was herself raised as a Presbyterian. From 1923 to 1935, she attended the James Gillespie’s School for Girls—a model for the Marcia Blaine School featured in The Prime of Miss Jean Brodie—going on from there to teach English and then to work as a secretary in a department store. In 1937, Muriel married Sidney Oswald Spark and moved with him to Southern Rhodesia (present-day Zimbabwe), but soon discovered that Sidney was manic-depressive and prone to violence. Consequently, Muriel left both her husband and newborn son Robin in 1940, and returned to the United Kingdom in 1944, where she worked in military intelligence until the end of World War II. Though she began writing seriously thereafter, primarily poetry and literary criticism, it wasn’t until after her conversion to Roman Catholicism in 1954 that Spark developed the scope of vision necessary to begin writing novels. While living in London, she wrote and published her first, The Comforters (1957), the proceeds from which freed Spark to pursue writing full-time. Following several warmly received works came, in 1961, The Prime of Miss Jean Brodie, which secured Spark’s fame, and which is largely considered today to be her masterpiece. Spark would go on to live in New York City and then Rome, where in 1968 she met her lifelong friend, the artist Penelope Jardine, with whom she settled in the Tuscan village of Civitella della China, where the two would spend the rest of their lives together until Spark’s death in 2006. For her literary achievements, Spark received many awards and honors, including the James Tait Black Memorial Prize for her novel The Mandelbaum Gate (1965), the Golden PEN Award (1998), and eight honorary degrees, one from the University of Oxford. 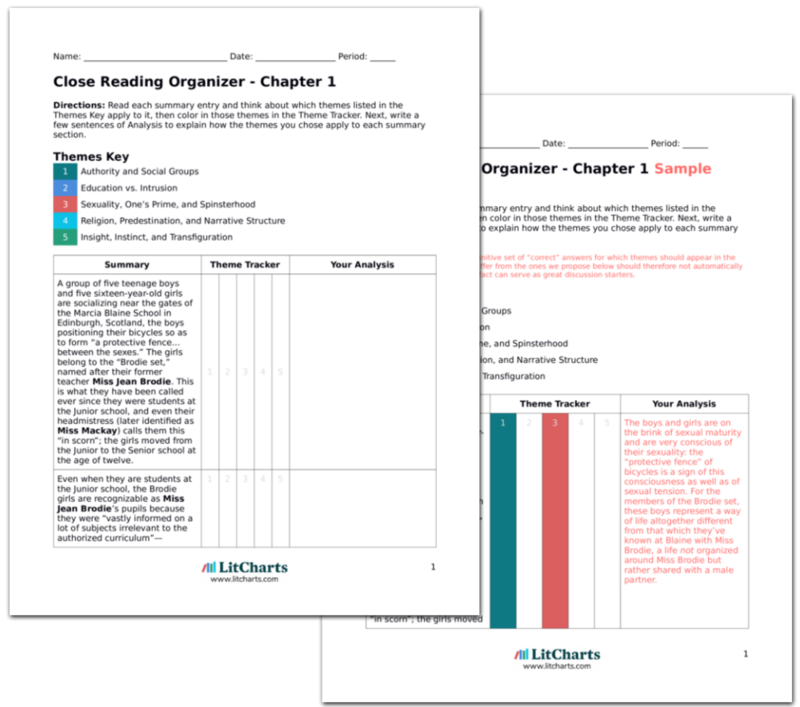 Get the entire Miss Jean Brodie LitChart as a printable PDF. Although published in 1961, The Prime of Miss Jean Brodie is set in the 1930s, and is especially preoccupied with the fascist governments that came to power during this period, in the decade leading up to World War II—those led by Mussolini in Italy, Hitler in Germany, and Francisco Franco in Spain. These governments were authoritarian, nationalistic, right-wing, and belligerent. After the collapse of Fascist Italy and Nazi Germany, intellectuals in liberal democracies found themselves deeply troubled by the question of how such states could arise in the first place, as well as by the question of how commonplace people could become enthusiastically loyal to such states even to the death. Indeed, these questions make up part of Spark’s area of inquiry in her novel: Miss Brodie herself is excited by what she witnesses in Fascist Italy—the efficiency and patriotism of it all—and the novel suggests that her influence over the Brodie girls is troublingly similar to Mussolini’s influence over his fascisti. In most fictions written before the twentieth century, narrative tends to unfold in chronological order, with cause leading to effect. However, Modernist fiction challenges this convention, just as Spark’s does. For example, Joseph Conrad’s novel Nostromo (1904) is littered with time shifts, analepses (flashbacks) and prolepses (flash-forwards), as well as breaks in the narrative. Such is also the case with Virginia Woolf’s To the Lighthouse, a book even more influential on Spark’s, which takes hundreds of pages to treat an ordinary day, and only a few paragraphs to kill off major characters. From these and other novelists, Spark learned how to create complicated narrative structures, favoring especially the technique of prolepsis in The Prime of Miss Jean Brodie. Spark also often treated Catholicism in her novels, and for this reason has come to be associated with the Catholic Novelists, among them fellow converts Evelyn Waugh and Graham Greene. Both of these writers believed that the religious sense restored importance to the human acts represented in their novels, as in Waugh’s Brideshead Revisited (1945) and Greene’s Brighton Rock (1938). In contrast, Spark, while a Catholic herself, may be said to be less a religious writer than Waugh and Greene and more a theological writer, interested in systematically studying the nature of God and faith. Climax: Sandy betrays to the headmistress of Blaine, Miss Mackay, that Miss Brodie is interested in radical fascist politics and that she even urged a girl to fight in the Spanish Civil War; this betrayal results in Miss Brodie’s forced retirement. Sitting for a Portrait. Spark modeled the character of Miss Brodie in part on Christina Kay, a teacher of hers for two years at the James Gillespie’s School for Girls. “What filled our minds with wonder and made Christina Kay so memorable,” Spark later recalled, “was the personal drama and poetry within which everything in her classroom happened.” Like Miss Brodie, Miss Kay displayed both prints of Renaissance paintings and posters of Mussolini’s marching Blackshirts. Miss Brodie’s Ancestor. In Chapter 4 of the novel, Miss Brodie claims to be descended from a man named Willie Brodie, a respected town official by day and a criminal by night. However, Willie is not a character of Spark’s invention: Deacon William Brodie is a historical figure, who in life was indeed a cabinetmaker in Edinburgh, a member of the Town Council, and a burglar hanged for his crimes on a gallows some hold to have been of his own making. Nor is Spark the first novelist to incorporate Deacon Brodie into her work: Robert Louis Stevenson, whose father owned furniture fashioned by Brodie, based The Strange Case of Dr. Jekyll and Mr. Hyde (1886) on the cabinetmaker-burglar’s double life. Wilson, Joshua. "The Prime of Miss Jean Brodie." LitCharts. LitCharts LLC, 24 Jul 2015. Web. 23 Apr 2019. Wilson, Joshua. "The Prime of Miss Jean Brodie." LitCharts LLC, July 24, 2015. Retrieved April 23, 2019. https://www.litcharts.com/lit/the-prime-of-miss-jean-brodie.